The Building Owners and Managers Association International, using the data found in its 2018 Office Experience Exchange Report (Office EER), has compiled a list of the most and least expensive private sector office markets in the United States based on total operating expenses. Total operating expenses incorporate all expenses incurred to operate office buildings, including utilities, repairs and maintenance, roads and grounds, cleaning, administration and security. New York City tops the list at $12.95 per square foot (psf), followed by San Francisco at $11.85 psf and Washington, D.C at $11.43 psf. Boston appears on the list for the first time in five years, and Oakland, California, is also a newcomer to the list—likely driven by the high cost of nearby San Francisco. At the opposite end of the spectrum, Salt Lake City takes the top spot as the market with the lowest operating expenses. 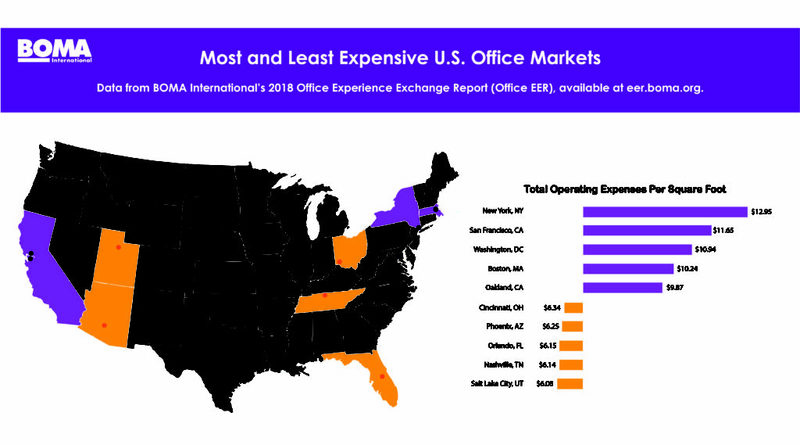 At $6.02 psf, Salt Lake City is less than half the cost of New York, the most expensive city. Nashville, Tennessee, and Orlando, Florida, hold the second and third positions on the list, respectively, with operating expenses only $0.01 psf apart. Overall operating expenses saw a moderate increase, as the industry continues to support a strong labor market. The Office EER provides critical insight into the performance of the office sector with more data than any comparable source in the industry. With extensive historical information, the Office EER allows users to conduct multi-year analysis of single markets, as well as generate customized reports based on various building characteristics and property types, such as medical office buildings, corporate facilities and government buildings. Both the Office EER and its companion report for the industrial sector, the Industrial Experience Exchange Report (Industrial EER), consist entirely of voluntarily reported data from commercial property owners and managers. Reports are easily downloadable as both Excel and PDF documents, and a subscription grants unlimited access; there’s no limit to the number of reports users can generate. For more information and to subscribe to the 2018 Office EER and Industrial EER, visit eer.boma.org.